Lightning has a tendency preferentially to strike taller structures and objects. Strikes to ground are, however, quite common where there is a distance between structures of more than twice their individual height. For lightning protection purposes an all conducting building, with metal cladding and roof, is an ideal structure. It effectively provides electronic equipment within it with a ‘screened room’ environment. Many steel framed or reinforced concrete buildings with metal cladding will approximate to this ideal. If lightning strikes the building, a ‘sheet’ of current will flow all over the surface and down to earth, provided that the cladding and roofing is correctly bonded together. Any small differences in resistance will have little effect on current flow – flow paths are dictated by inductance and not resistance, owing to the fast impulsive nature of the lightning return stroke and restrikes. Current flows in steel framed or reinforced concrete structures show a similar preference towards external conductors. 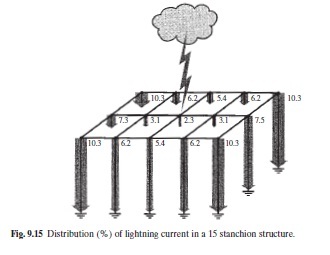 Figure 9.15 shows that even when lightning strikes the centre of a building’s roof, the majority of the current will flow down external conductors rather than the nearer internal conductors. Thus, buildings with large numbers of down conductors around the edge of the building will have greatly reduced magnetic fields inside the building, minimising the risk of transient interference to electronic equipment from the building’s lightning protection system, provided, of course, that power and data cables are routed away from the down conductors.